Sebenarnya, nama software ini BOOTICE atau BOOT ICE sih ? BOOTICE is a powerful boot-related utility. It's desired to manipulate (install, backup, restore) the MBR and PBR of disks (or disk images), to partition and format disks, to edit disk sectors in hexadecimal, to erase all the data on your disk or logical drive (by filling with customizable characters), to edit Grub4DOS boot menu, and to edit BCD file of Windows NT 6.x. Berdasarkan informasi terbaru, versi teranyar dari BOOTICE adalah BOOTICE v1.3.3.2. Dalam versi yang dirilis 16 Februari 2015 ini terdapat dua versi, yaitu versi untuk x86 dan x64. Berikut ini merupakan daftar semua versi BOOTICE karya Pauly yang saya ketahui informasinya. Saya akan sangat senang jika Anda mengetahui versi-versi BOOTICE lainnya, dan mau berbagi informasinya. Free download BOOTICE v2012.05.20 from all versions of BOOTICE here . Free download BOOTICE v2012.09.20 from all versions of BOOTICE here . Free download BOOTICE v0.9.2011.0326 from all versions of BOOTICE here . Free download BOOTICE v0.7.8.0 from all versions of BOOTICE here . Free download BOOTICE v0.8.2010.1228 from all versions of BOOTICE here . 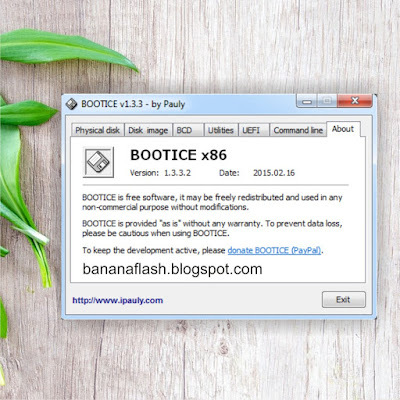 Free download BOOTICE v1.3.1 from all versions of BOOTICE here .